Posted June 21, 2017 by admin & filed under Bondi View, Featured Bondi View. The landscape of NSW is about to undergo a radical shift if the Berejiklian Government has its way with NSW legislation changes, which will allow property developers to fast-track land clearing approvals. The current NSW government has a less than impressive environmental record. Many Sydneysiders still remember the reign of Premier Baird’s leadership, which saw Sydney lose a massive numbers of heritage trees in a misguided drive for more rapid development. 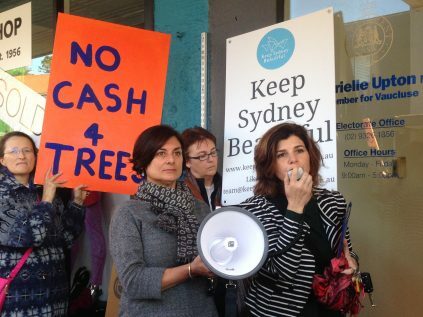 “People are really fed up with the loss of precious bushland and landmark trees. These kinds of decisions really beg the question whose interests does the NSW Government has at heart, the community or the toll road lobby?” said the Greens Upper House MP Dr Mehreen Faruqi. Ms Faruqi is also the Greens NSW Environmental Spokesperson. “We need strong, effective conservation laws that will stop the loss of trees and bushland across our state. The NSW government’s new Biodiversity Conservation Act is not good for biodiversity or conservation. It deliberately undermines both,” she added. As part of the reforms, the government is proposing ‘offsetting arrangements’ that will enable property developers to fell trees for cash. Currently a like-for-like offset is the standard approach. If you want to destroy bushland and trees – you must find something similar nearby to replace it with. If these legislative changes are introduced, organisations like Saving Sydney Trees estimate the new changes will see tens of thousands of Sydney’s trees at risk, particularly in urban renewal areas or where major infrastructure projects are currently proposed or have not even been applied for. “Buried within the regulation is the Biodiversity Offsets Scheme which fundamentally allows developers to pay cash for trees,” explains community spokesperson Maria Bradley. “This new regulation says developers can just pay some cash into a fund – which can be used for something as ridiculous as an educational night on the area the developer just destroyed, and not replace it at all,” details Ms Bradley. Woollahra Council, which sits at the heart of the current NSW Minister for the Environment Gabriel Upton’s seat of Vaucluse, unanimously adopted a motion noting that the changes to the regulation being considered by State Government pose a risk to the Council’s ability to protect and maintain its urban tree canopy. If you would like to object to the NSW government to the Biodiversity Offset Scheme call Gabrielle Upton’s office now (02) 8574 6107 or fax in your objections on (02)9339 5546.